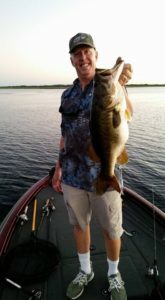 West Lake Toho located in the small town of Kissimmee, just minutes from Disney world here in Central Florida is typically the top trophy bass lake in the state, and big wild Shiners are always the best way to catch these giant Florida bass. The fall season is a unique and special time for largemouth bass on Toho, there is a big increase of activity and the reason behind this is water temperatures are dropping to prime levels for Florida bass along with there instincts telling them to feed up for winter. Also during the summer months the U.S Corps of Engineers lowers the water levels for the possibility of flooding during summer rains and hurricane season, they then fill the lake back to full pool levels in September, which brings the water in the grass beds back to there normal water range which also increase’s there activity. With this increase artificial lures and shiners become very productive. Just yesterday evening my son and I went out on Toho fishing for a couple of hours before dark. Using mainly soft plastic lures rigged weedless, we were fishing grass lines and really had a fun time catching bass just under 8 pounds. I really had a great time bass fishing Toho with my son making memories that we will never forget. So if you are in the Central Florida area or are planning a trip here with your family give us a call and lets get you on the Florida bass fishing adventure of a lifetime. We know where your trophy lives.